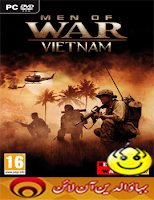 Brutally tough and unforgiving, Men of War: Vietnam is a serious test of your patience and your real-time strategy skills. How much you enjoy Men of War: Vietnam depends on your patience for constant saving and reloading. Just like in the earlier releases in this 1C Company series of real-time squad combat games, the difficulty has been cranked through the roof. Your small squads have to battle their way through dozens if not hundreds of enemies in each and every mission, with even a single misstep often resulting in instant failure. That doesn't sound like a whole lot of fun, and it isn't. The mission design is so grueling that you feel wrung out by the time you cross the finish line. Still, there are some positives. Maps are intricately designed, and a cooperative option for the campaign lets you team up with as many as three other players, which both makes things easier and adds some replay value. At least Men of War: Vietnam is honest up front. The very first mission tosses you into the deep end without any life preservers. Denied even the benefit of a brief tutorial or some tips on how to handle the first few enemy encounters, you're thrown into the midst of a battle between the US and a small group of Russian advisors and Vietcong soldiers. A Huey incinerates your convoy in the scripted opening seconds and then returns to obliterate the paltry four survivors in your squad within moments. Either you get your guys off the road and under cover in less time than it took you to read the start of this paragraph, or everybody dies. It's an abysmal introduction. It's hard to imagine anyone new to the Men of War series sticking around for very long after this greeting. Even series veterans can't help but be taken aback by how brutally the game begins. Playing on easy helps a bit by reducing enemy numbers, but the game remains incredibly punishing. The two-part campaign that sees the first five missions focusing on Russian and Vietcong troops and the second five missions swinging over to the US is unforgiving all the way through. You go into missions with tiny squads ranging from just four guys to around a dozen or so, and you have to fight and/or sneak your way through huge maps crawling with countless enemy patrols and dotted with umpteen goals. The playing field is so tilted against you that you're at risk of it falling on your head at any moment. Enemies can spot you from long distances, hear you even when you're firing silenced rounds, and shoot you with unerring accuracy even when you're hunkered down behind brush. The entire squad can be wiped out in mere moments, at almost any time. You need to creep forward very cautiously, experiment with a lot of trial and error, and save every time you do anything even remotely good. Kill a bad guy? Save. Find a great cover spot? Save. And so on. At least the game helps out by autosaving at smart, frequent intervals. There are a couple of saving graces. Mission maps are extremely detailed and come with multiple options to get past every enemy troop position. Granted, sometimes none of them are pleasant, but at least you have many choices, ranging from open assaults to flanking maneuvers to firing locations and weapon selection. Enemy artificial intelligence is lacking, too, though at least the stupidity of your foes makes it easier to complete scenarios against the incredible odds. Foes typically respond to attacks by going back to standard patrol routes, oblivious to the corpses of their comrades and the burning wreckage around them, or by walking mindlessly into the jungle until your lads shoot them to bits. When you're beaten, you're beaten through sheer force of numbers or by superior enemy positions like bunkers, but never from being outsmarted. Unfortunately, your own troops aren't very smart, either. They often switch weapons for no apparent reason in mid-battle and ignore enemies gleefully murdering the whole squad from a few feet away. Maybe it's the cover itself, or maybe it's dumb soldiers not standing in the right spots, but your boys often seem to think they're hidden when they're exposed enough to take a bullet to the head. Targeting isn't very accurate, unless you micromanage troops with direct control, which is hard to do in the middle of a big scrap. You can order your squad to assault a lone VC hiding behind a truck, for example, and watch in horror as your lads line up behind the bumper and fill it full of holes…while your enemy pops out of cover and slaughters everyone. Special abilities and weapons offer some chance at survival. There is something of a role-playing flavor here with named squadmates who come equipped with gear and combat skills. At times, the game resembles the Commandos series. Troops with silenced SMGs, sniper rifles, and big M60s provide you with a shot at whittling down enemy numbers. That said, the small size of your squads makes it devastating when just one man is killed. Lose your sniper, and it's pretty much game over unless you're in the home stretch. Jungle terrain is both an ally and an enemy. The engine does a great job rendering the foliage of Southeast Asia, and it isn't just for show. It's so thick that you can ably stage hit-and-run raids where you blitz enemy positions and then fade back into the green. Bad guys take advantage of the green stuff as well, though, and it's so voluminous that you often can't see anything. Events develop so fast that your men might be slaughtered before you can get the camera properly into position. You expect a lot of jungle in a Vietnam game, of course, but it seems like you wind up with a big frond in your face every time you adjust the camera the slightest bit to better view a firefight. All of the campaign missions can also be run through cooperatively with up to four other players. This is the best way to play the game, as it mitigates the extreme difficulty of going solo. It also lets you tackle objectives more efficiently via coordinated attacks. Some missions seem to have been designed with co-op in mind. The first mission, in fact, features a section where you must detonate three US Hueys before they take off. This is hard to achieve playing solo without sacrificing at least one man during the assault, because the choppers head to the skies almost as soon as you open fire. But when you're playing with a buddy, you can divvy up the targets to blow them all up before the pilots can get the rotors spinning. Unfortunately, there are some technical problems with online play. Connection errors frequently pop up on the server screen, making it impossible to join many matches. This may be because of conflicts between various versions of the game sold by different retailers or conflicts between those who purchased the DLC pack released alongside the main game and those who did not. Either way, a patch is desperately needed. Even when you can get into games, the play is a bit laggy, and synchronization issues frequently arise. As frustrating as Men of War: Vietnam is, it still provides some satisfying moments. Emerging hale and hearty at the end of a mission is always cause for celebration, seeing how the odds are so slanted against you, and the opposing forces are made up of what seems to be the entire US Army or Vietcong. Still, the extreme challenge is a tough sell, and it makes it so difficult to get past the first mission that you might never get to the point where you can get hooked.